Camp Shalom is hiring Counselors (18+) to work on-site at the Goodman Campus from June 17 to August 16 with campers entering grades K-5. 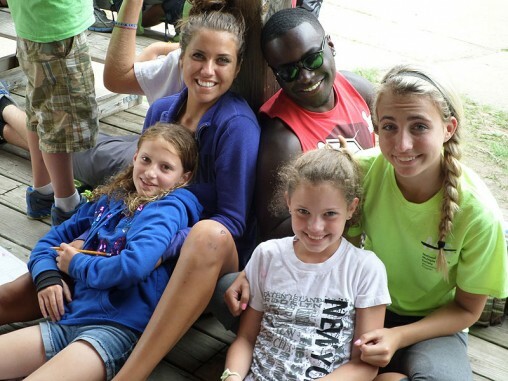 Camp Shalom Noar-Bogrim is hiring Counselors (18+) to lead on and off-site programming and on-site Administrative Staff (21+) to work June 17 to August 2 to with campers entering grades 6-9. All available positions and general requirements are listed below. We are looking to hire enthusiastic, creative and active counselors who are comfortable with the outdoors. Applicants should be flexible, patient and reliable and must enjoy working with people. An additional stipend may be available if you are willing and able to song lead during part of the day and to those who are certified lifeguards. Counselors will plan and lead a variety of engaging activities, will work to build a strong sense of community among campers, and will maintain a physically, emotionally and socially safe camp environment for all. Complete mandatory staff training week and all required paperwork. Must have the physical ability to lead and participate in camp activities which include, but are not limited to swimming, team building initiatives, building campfires, physical games, and activities. Must have the ability to physically and emotionally support children when needed. Junior Counselor starting pay: $2450 ~ This position has been filled. The Camp Shalom Counselor will be responsible for the general safety and development, growth, and skill achievement of the participants in his/her group. They are also responsible for planning, leading, and implementing core and non-core programs and experiences for children throughout the camp day. The counselor will provide high quality outdoor educational and recreational experiences for participants that focus on Camp Shalom’s core values and make every day a great day. In addition to the responsibilities listed above the Camp Shalom Senior Specialist will be responsible for planning and implementing age-appropriate daily activities in their specific area that will help the campers develop skills, teamwork and sportsmanship. Strong group management skills are required to engage children and staff in daily activities. Specialists will be hired based in specific activities such as soccer, dance, musical theater, basketball, creative writing or tennis. Others will lead a variety of activities such as ultimate Frisbee, flag football, rugby and lacrosse. Specialists must be at least 18 and have experience organizing relevant activities. Specialists must participate in pre-camp instructor-based training and all staff training before camp begins. We are looking for an outgoing, organized and enthusiastic activity leader to lead programming at a day camp serving 11-14 year olds. As Activity Lead, you will be part of the Administrative team and have responsibility for collaboratively developing and implementing programming for 11-14 year olds. You will keep the daily schedule on track, support camp counselors in developing and implementing programming, and coordinate with area venues to set up field trips for groups of campers. You must be an enthusiastic person with strong group leadership skills, be able to work effectively as part of a team, have experience working with youth, and have strong organization and time-management skills. Applicants must possess strong people skills, be responsible, motivated and positive. We provide training and will entertain proposals for internships. Camp work is a great resume builder--you will be given the opportunity to develop and use leadership, organizational, collaboration and problem-solving skills. This administrative position is full-time for seven weeks, but also requires some pre-camp hours in the spring. As a member of the administrative team, you will need transportation to and from camp. We are looking for an organized individual with some experience supporting children or adults with disabilities. You will work in an inclusive day camp serving 11-14 year olds and will support counselors in meeting the needs of any campers with disabilities, allergies or other special needs. As Individual Needs Administrator, you will be part of the Administrative team and have responsibility for gathering information from families prior to the start of camp, coordinating with any support agencies, and putting together information for our camp staff in order to ensure that they are able to safely and effectively support any campers in their groups with special support needs. Some direct support of campers with disabilities will be needed, but will not be your primary role. This is an ideal position for anyone going into a human services field. You will gain experience working with families and campers and will develop and oversee support plans. You must be a positive person with strong leadership skills, be able to work effectively as part of a team, have experience working with youth, be responsible and flexible, and have strong organization and time-management skills. We provide training and will entertain proposals for internships. Camp work is a great resume builder--you will be given the opportunity to develop and use leadership, organization, collaboration and problem-solving skills. This position is full-time for seven weeks, but also requires some pre-camp hours in the spring. As a member of the administrative team, you will need transportation to and from camp. Bring your love of outdoor activities, arts, crafts, cooking and other hobbies and interests to 11-14 year old campers. You’ll work in a unique program that combines off-site adventure (exploring state parks, downtown Madison, and other sites in and around Dane County) with on-site creative activities of all types. We are looking for applicants who want a fun job, enjoy summer activities and have hobbies or interests they would be excited to share with others. Applicants must possess strong people skills, be responsible, motivated and positive. We provide training and will entertain proposals for internships. Camp work is a great resume builder--you will be given the opportunity to develop and use leadership, organizational, collaboration, and problem-solving skills. Get paid to hike, swim, kayak, cook and try out your favorite activities with a great group of kids! Additional pay may be available if you are an experienced song leader. This is a seven week position that leaves most evenings and all weekends free for you to enjoy other interests. Transportation to and from camp is available for most days of employment.